All your MSN, yahoo , AIM, ICQ, google Talk and facebook buddies in one single buddylist. You have friends on both MSN and Yahoo? Or you have two MSN accounts? No problem! Now you can chat with them all from your mobile.With eBuddy Mobile Messenger you can have all your buddies from multiple IM accounts in one single list. Now you can take a cool picture with the camera on your phone, and send it directly in a chat to your friends! Just open a chat, click on Menu and choose Send Picture.Your friends can always view this picture, no matter what network or application they are on. With eBuddy Mobile Messenger you can share all the cool things you do in an easy way.You can set your personal message and take a brand new display picture, directly from your phone's camera. Want to talk to a buddy, but he just went offline? Just send an offline message straight from your mobile. 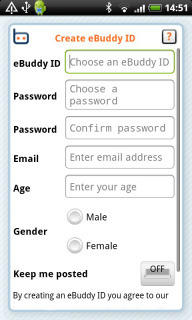 eBuddy Mobile Messenger supports offline messaging.You can also receive offline messages. As soon as you login, you will get all the messages that were sent to you when you were offline. EBuddy Messenger For Android P..